Back to Drought index page. Along California's central coast near the beach city of Cambria stands a swath of Monterey pine trees, one of three groupings of the native trees left in the world. The site has been protected for years from tree cutting because of its rarity. Now, in the fourth year of the Golden State's drought, those trees that cover nearly 15 square acres are as much as 90 percent dead, their needles turned from green to grayish-white. It's the stuff of nightmares for Mark Miller, fire chief for the Cambria Community Services District Fire Department. "I'm extremely worried," Miller said. "I'm freaked out by it." The lethal potential for a fire there has been compared to the Oakland-East Bay Hills firestorm of 1991 that killed 25 people and injured 150, he said. In addition to dead trees in Cambria, there's limited local water, Miller said. The few roads there are winding and narrow with only one option for exit at some points. Many residents are older and would need help evacuating. There are only two fire engine crews locally, with the next closest engine under mutual response being 30 minutes away. "The community of Cambria faces a severe fire threat due to a combination of environmental, geographical and demographic factors," a San Luis Obispo County grand jury said in March. The Monterey pines are just some of the trees in California that are dying, or heading that way because of lack of water, higher temperatures and bugs that thrive in dry, hot climates. The southern end of the famed redwood trees that stretch from Big Sur to the Oregon border also are waning, experts said. "In the drier southern part of the range, the trees are not really doing well right now," said Todd Dawson, a professor of ecology and physiology at the University of California, Berkeley. "They're really suffering from the severe water stress." Dawson has been studying the redwoods from Oregon to Big Sur for five years, starting before the ongoing drought. That allows him and his fellow researchers to more clearly see the effects of lack of water. A combination of factors has contributed to the decline of trees, he said. Temperatures have been rising over the last century, Dawson said, and there's been less rainfall for four years. Last year's precipitation was 22 percent of the normal amount, he said. That means there's less moisture in the soil for tree roots to take up. 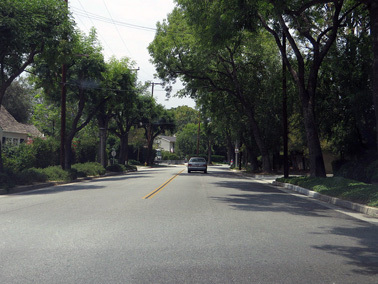 A shady street in South Pasadena where redwood trees, at the southern end of their historical range, are beginning to show unusual stress from California's record drought. Photo courtesy of Flickr. Trees at the southern end and eastern edge are losing branches and leaves, an indication that they're dying, he said. "It's very clear that the trees in the southern and eastern margins are all seeing levels of water stress that they've never seen before," Dawson said. Those at the southern end "may not make it through the summer." While right now just those sections of the redwoods are imperiled, he said, that will change if the drought, now in its fourth year, goes to a fifth, sixth or seventh year. "It's just going to march north," Dawson said of the tree death. Blue oaks in the state's Central Valley also are drying out, he said. Their leaf size has declined by more than 65 percent. "At this stage, we're not sure whether they're dead, or they're just going to take a break this year," Dawson said. "If there's a drought next year, we're not sure if they're going to come back." A similar phenomenon is happening in Southern California. Some of the coastal redwood trees indigenous to Northern California were planted in Los Angeles and San Diego as much as a century ago. Some are dying in both cities. In San Diego's expansive Balboa Park, which also houses museums, some of the redwoods are in a canyon where it would be difficult to place irrigation lines, said Casey Smith, district manager for San Diego. In addition to lack of water, the trees have been hit by bark beetles, which thrive in droughts. "It's definitely stepped it up a little bit," Smith said. "They've become more aggressive." Drought and bark beetles also are killing some Canary Island pines, he said. The city is to preserve what trees it can and is putting a special kind of irrigation line around each one and is covering those with mulch. The city also is only planting drought-resistant trees now. Many of the trees already planted in Southern California thrived in an environment that involved importing water from Northern California when supplies were greater, tree experts said. The Magnolia grandiflora tree, known for its large white flowers, relies on humidity that doesn't exist as much in L.A., as people remove irrigated lawns. Maples imported from the East Coast and Midwest also are heavy water users, said Frank McDonough, botanist at the Los Angeles Arboretum. The Liquidambar tree "needs lots of moisture, which is generally provided by lawns, but we don't have any lawns anymore." Many trees also rely on groundwater that's no longer dependable, McDonough said. When more residents had lawns and watered that grass, trees with long roots soaked up some of that moisture, he said. That's changing as the Los Angeles Department of Water and Power and other local agencies offer residents money to rip out water-dependent greenery. "We've been a grand experiment, or maybe a way to thumb our nose at nature," McDonough said. "We do have a lot of trees that are not consistent with our climate." That's upped the wildfire potential in many places, he said. "There's a huge risk of fire sweeping across suburban areas when you have huge areas of dead trees," McDonough said. The state's Urban Forestry program is encouraging urban residents to keep watering trees, despite restrictions on water use in the state. There are about 300 urban water districts that must impose water consumption cutbacks ranging from 8 to 36 percent. But trees are important for benefits that include providing shade that reduces electricity use, said John Melvin, state urban forestry manager. "The take-home message is you can meet the 36 percent reduction without stopping watering trees, but there are things you're going to have to do to keep the tree alive," Melvin said. Needed moves include putting mulch around the base to hold water in the soil. "Water them appropriately, occasionally and deeply," Melvin said. Throughout the state, people are weighing options for lowering fire risk created by dead trees. The Cambria Community Services District Fire Department has applied for grants to fund removing some of the dead Monterey pines, said Miller, the fire chief in Cambria. He estimated the expense at more than $400 million. There's hope some of the money could come from revenues generated by California's cap-and-trade program for carbon emissions, he said. Removing the trees would qualify for the state's climate goals because it would create space for new pines to grow and capture greenhouse gases. There's also the option of using the cut trees as biomass to make electricity through a portable cogeneration facility. A temporary mill could create lumber products, Miller said. "These are the two ideas currently on the table," Miller said. The dead and dying trees in forest areas are a concern to the California Fire Department. It's been estimated that 12 million trees in the state have died or are in the process of it, said Lynne Tolmachoff, information officer with Cal Fire. It's a concern because "we're coming very rapidly into the peak of fire season here," Tolmachoff said. In many cases, she said, the trees have to be left alone so nature can run its course. Clearing dead trees is a risk, she said. Bringing equipment in on trucks and using it can spark fires. In addition, there's the issue of creatures that live in and around dead trees. And there's a limited number of mills that can take the cut-down trees. Fires, while destructive, are natural and needed to help a forest regenerate, she said. The state has kept larger-than-typical firefighting crews on through the winter and spring, she said, because of fire risk. That's helped prevent large, uncontrolled burns. But as more trees die, the risks mount. "Each year that this drought continues to go on, it's getting much worse," Tolmachoff said. "It's a wait-and-see game every year." 'No silver bullet.' Can Calif. save its utilities?